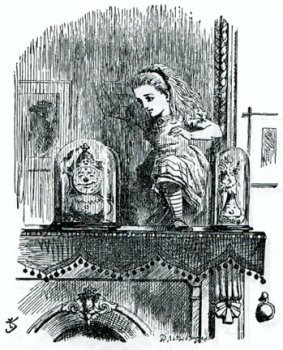 Through a two-way looking glass, you see your Alice: is feminist biography necessarily a modernist pursuit? In theory Alice Paul [1885-1977] and I were a perfect match. She was one of America’s most intrepid, albeit polarizing, feminists, whose career spanned practically the entire twentieth century from suffrage militancy to second-wave feminism; no major biography of her had ever been completed. I had spent almost my entire career as a women’s historian writing about the fortunes of feminism through the lens of feminist biography. As an independent scholar unencumbered by regular teaching responsibilities, I had the time and energy to put in the years of research that it would likely take to complete the project. An added bonus: Paul’s papers were at the Schlesinger Library at Radcliffe, practically across the street from where I live. After almost a year of sustained research, I finally had to admit that Alice Paul did not speak to me as a subject. In a profound failure of my historical imagination, I found myself at a total loss when searching for an overarching theme or hypothesis to make her life story compelling and relevant to contemporary readers. In other words, that spark of connection just wasn’t there. And yet lurking in my decision to abandon the project were questions beyond my personal failure to make the topic come alive. How can you write a feminist biography when your subject has left no trail of breadcrumbs (as a friend called them) to recreate any kind of interior or personal life? How do you make fifty years of laying the groundwork for [the Equal Rights Amendment] that ultimately failed seem accessible and interesting to readers? More fundamentally, what if some lives are not in fact suited to a full-bore, cradle-to-grave biography in the first place? I offer my story as Alice Paul’s would-be biographer to shed light both on the process of doing feminist biography and on why Alice Paul remains such a complicated, indeed elusive biographical subject. Yet even then Alice Paul held back, deliberately and consistently refusing to supply any detailed personal information or observations, even when prodded by Fry. For example, when Fry asked about her father’s death when she was sixteen, Paul claimed that she was too young for it to have been much of a blow and that life just went on. Then she interjected, tellingly, “None of this is of any importance, but I only tell you because you asked me.” When it came to her organizational work, Paul showed a persistent tendency to refrain from saying negative things about other women, even arch rivals like Carrie Chapman Catt: “I don’t like to have attacks on anybody going down in history.” Or as she said to Fry at another point, “If I ever say a single word critical of anybody, leave it out, will you, because I am only saying it for you.” Luckily many of these asides did survive in the final edit, but it is clear that Alice Paul was censoring herself throughout the sessions, rarely letting her feelings come through. Still, the oral history remains indispensable to unlocking her inscrutable character, as well as critical for connecting the suffrage and ERA periods of her life, both essential tasks for the biographer. Scholars are free to write the books they want to write–and of course Ware was undoubtedly right to abandon Alice Paul because Ware wasn’t going to be able to write her life the way she wanted to. (She was brave, too, to walk away from a year’s work.) But Ware’s objections to Paul as a biographical subject pose a real challenge to biographers and historians who write about subjects who lived before the nineteenth century, and especially premodern women subjects, whose paper trails are awfully scant by comparison to modern women and to premodern, literate, and elite men. One of the hallmarks of recent feminist biography has been the foregrounding of the interplay between the personal and the political in constructing narratives of individual women’s lives. Starting in the 1970s and picking up steam in the 1980s and 1990s, feminist biographers helped to reshape the field of biography as a whole by showing the benefits of an interpretation of a life that did not focus exclusively on public achievements and events but also took into account the daily rhythms and patterns of personal lives—family responsibilities, relationships, finances, living arrangements, and so forth. This approach was especially relevant for understanding the contours of women’s lives, shaped as they were by the need to navigate and engage conventional gender roles, but it proved fruitful for biographies of men as well. But what if a person’s life was in fact her work? Ware is very convincing about Paul’s overwhelming commitment to the cause of suffrage, to the National Women’s Party which she founded, and to the passage of the ERA, and she writes movingly about the price Paul paid for not cultivating warmer personal relationships with younger friends and family members and not planning (practically or financially) for her retirement and declining years. She was pretty much isolated and robbed by an opportunistic nephew, dying in a Quaker nursing home in 1977 after two debilitating strokes. But based on Ware’s portrait of Paul until her strokes, this seems like exactly the kind of ending that she was aiming for–except for the being robbed part, but she didn’t have all that much of an estate to begin with. A person who is “absolutely concentrated on now,” in the words of her compatriot in suffrage Inez Haynes Irwin, doesn’t plan for retirement, write a will, make a trust, or donate her papers and her estate to make a house museum and archive. Is it really possible to argue that Alice Paul’s life can’t be understood as a feminist biography because she chose not to have (or reveal) a personal life or to record her interior life for our degustation? Is the work really not enough? Do we have to write histories only of relateablepeople? Quite frankly, Ware herself offers up all of the key elements of a great story: drama (in that Paul was a controversial figure), a hero (Paul herself), and villains galore (the nephew, various policians from the Progressive Era through the Nixon years who opposed suffrage and the ERA). I know more than a few women who have made choices in their personal lives that male politicians and ambitious professionals never have to make–they have wives to take care of all of those details. Alice Paul had servants, who probably didn’t write their own memoirs or leave their papers to the Schlesinger Library. And yet the potential Alice Paul biographer will likely throw up her hands in despair. There are already so many massive archives to master: the entire suffrage collection at the Library of Congress, the 179 reels of NWP microfilm, the League of Nations documentation in Geneva, the multiple collections at the Schlesinger Library, to name just the most obvious. Is it really feasible to double or quadruple the research agenda to look for what truly might be needles in a haystack—the rare glimpses of Alice Paul the person—to augment and complement our understanding of Alice Paul the feminist activist? The fear, or trap, is that her character would remain just as elusive as ever, and the book project would drag on indefinitely. The ghost not just of Alice Paul but of Amelia Fry, who died in 2009 without completing the biography of Paul she began in the 1970s, haunts the landscape. Behind all these doubts lies the lurking suspicion that perhaps certain historical figures are not in fact good fits for biography. That is, aspects and specific moments of individual lives may be significant and compelling on their own but there may not be enough of a through-story or narrative arc to warrant surveys of the entire lives. But what biography ever written really gives equal time to each and every year of a subject’s life? (“At age three, Isaac Newton was a thriving toddler who particularly enjoyed summer days for the long walks he took with his family and the availability of fresh stone fruit.”) All biographers compress years or even decades into a single chapter–usually the happiest days of a subject’s life, because there is relatively so little conflict to write about. At the same time, they can write chapters sometimes on just a year or two, or on a week, or on a particularly stimulating exchange of letters. It seems to me that that’s part of the judgment that good writers and storytellers must exercise. Read Ware’s whole article–I believe she makes a very strong case that Alice Paul created (through all kinds of neglect) just the kind of archive she wanted, one that will largely dictate the kind of biography that she’ll get. But, isn’t that just what you’d expect from Alice Paul, who didn’t want “attacks on anybody going down in history?” Evidence of internal dissent would have betrayed the feminist cause, the cause to which she had devoted her entire life, and one that she knew had to hold together in order for it to succeed. This is an old woman’s worry, not the worry of the hunger-striking, vindictively jailed Alice Paul of the 1910s. Sometimes our subjects are in fact pretty poor judges of their own lives. She outlived Carrie Chapman Catt and all her older rivals, and even most of her generational peers of young suffragists. She even lived to know another generation of determined feminists and a resurgent cultural right in the 1960s and 1970s. It seems like that’s a life worth writing about, and a life worth examining on its own terms. Though it’s not my field, I did a project on grad school on the Pankhursts in England, and found some similar problems; in particular, feminist biographers have generally found Sylvia Pankhurst more sympathetic and relatable, perhaps partly because of her socialist politics, whereas Christabel Pankhurst, who became an evangelical Christian after suffrage was passed, has generally had less sympathetic biographers. The autobiographies left by the two sisters are also strikingly different: Sylvia’s The Suffrage Movement has many detailed personal anecdotes, whereas Christabel’s Unshackled is a much more impersonal account of the suffrage struggle. I’d agree, this seems pretty unconvincing, except as a case of failure of will, or of being overwhelmed by the extent of the sources available. Although in the end, everyone has to decide whether or not they want to be effectively inhabited by whatever it takes to get *any* big project done over a course of years. Maybe there’s an editor/publisher back-story lurking behind this problem; although I haven’t read the whole article–because of where I’m sitting at this minute. I sometimes feel I’ve spent almost forever working on, or writing about (or not writing about) people who were artifcatually “inarticulate,” not because they were embedded in the oppressed or silenced classes, but because they were just not all that expressive or introspective, or because their successors in interest didn’t preserve the crumbs underlying their oeuvre. I guess I also like more to reconstruct than to *de*construct, and can thus take a lot of satisfaction in snooping out whatever there is to find–and maybe a good bit more than anyone thinks there is to find–and hope for the best as to the interpretation part. I can actually quite imagine not wanting to work my way through “hundreds of file boxes” of personal papers lined up in a row in a single archive or two, although a box or two here and there in a half dozen scattered places would be gratifying. I guess in the end I’d say if she can’t write a “feminist biography” of this subject she should just write a biography of this feminist subject and let the crowd (or the cloud) take it from there and fill in the presumptive holes in criticism, or in reactive or follow-up work. But not before saying that in the end it’s her call. There would be nothing worse to read than a book by someone who hadn’t wanted to write it in the end. As a scientist–not a historian–I can identify with her having put a bunch of time and effort into this subject, and ultimately just not feeling like she could generate a coherent narrative from what she had found. This happens in science all the time: you do a bunch of experiments, obtain lots of seemingly relevant results, but you can’t put it together into any kind of compelling model. In those cases, frequently you just give up and the data languish on the real or metaphorical shelf. The point of this analogy is that I wouldn’t necessarily consider Ware’s decision not to write a Paul biography evidence of a failure of imagination so much as evidence of an imagination differently constituted. To preface: I haven’t yet written a book, so I recognize that there’s much I have yet to learn about bringing a massive project to public completion (as opposed to a dissertation, which isn’t really all that public). And I’ll also echo the previous comments that support her call to abandon any project that doesn’t fit with them, for whatever reason. In fact, I think that’s the most interesting and useful part of the article (which I’ve admittedly scanned quickly) is her discussion of why she didn’t fit with the material. All that said, what I find baffling is that she lists at the very beginning a perfect example of the kind of biography she believes Paul’s papers allow: Susan Pedersen’s Eleanor Rathbone and the Politics of Conscience. In fact, her descriptions of Paul seemed so close to Rathbone that Pedersen’s biography came to mind immediately on reading your post, well before I went to the article and saw Ware’s mention of Rathbone. Rathbone was a woman who spent her entire life advocating for family/child allowances (she did other things as well, but that was a cause she wouldn’t drop), a plan ultimately successful but which became a minor part of the development of the British welfare state in the mid-1940s. She was a woman for whom the work was everything. And while there were copious documents for Pedersen to work with, there was one enormous gap in terms of Rathbone’s personal life. The woman she lived with for decades (a relationship Pedersen deals with exceptionally well) burned all papers referencing them after Rathbone’s death. I bravely assigned the biography to my undergrads this year. They didn’t warm to it, but even the reasons why they struggled with it were instructive. For them, it was a slog to read through all of Rathbone’s political and legislative work, but for many, it made clear in a way that nothing had just how hard and long the battle for rights was. In fact, one of my favorite end-of-semester-wrapup comments came from a student who made clear that she was no feminist, but she really enjoyed learning about British feminism, especially realizing the difficulty of the battle. So while I’m fine with Ware moving on to another project, her reasons—at least those related to feminist biography—make little sense, given the award-winning precedent she herself mentions. Thanks, everyone–fantastic comments. Indyanna, I so relate to your notion of being a reconstructionist rather than a burrower-through-hundreds of file boxes. And thanks, CPP, for the great interdisciplinary perspective. I am sure Ware will one day read a terrific biography of Alice Paul. Thefrogprincess, thanks for your comments on the comparison to Pedersen’s Eleanor Rathbone, something only an expert in the field would pick up on. Clio’s disciple, your comments on the (perceived) need for a “sympathetic” subject really resonate with me. I’m writing about an 18th C Urusline nun, someone whose life commitments and values will be largely at odds with the audience for my book. You comment has made me wonder if my subject’s “victim” status (as a child captive taken in the Indian wars) isn’t a key part of people’s interest in her, and even to her appeal to me. I also wonder about this distinction between an outward, political persona and interior, personal life; it feels a bit too much like reinforcing the private/public division that feminist and women’s historians have been interrogating for the last 30 years. I get the importance of the personal to the political and don’t think it should be ignored, but I think that for some people the ‘political’ may well become the personal. As academics, we all know how our research can come to encompass our thoughts during every waking hour, affecting our relationships and how we relate to the world around us. We know that it can be hard to drag ourselves back from that and to form other interests, prioritise other relationships etc. So why would this be different for historical subjects, particularly those whose lives are dominated by passions such as this. I think this might especially be the case if your other relationships are relatively non-contentious or supportive of your vision. The work, especially of certain types of social justice campaigning, becomes your life, becomes your interior, becomes the basis of your relationships, becomes what you talk about, think about, how you raise your children. So, I’m left wondering what are we looking for when we look for an interior, private self? And why is that different from a ‘work’ or ‘public’ self? (Do we really think that our work lives says nothing about ‘us’?) What do we feel we are missing when we say we can’t catch sight of an interior despite copious amounts of surviving evidence? And, why do we assume that there is a single unified self (certainly something that’s been critiqued by numerous feminist scholars in the last few decades, as a product of male, Enlightenment thought)? Well, that’s basically what Dror Wahrman argues in the Making of the Modern Self- the concept of an ‘interior’ self is an enlightenment product, just like domesticity and the public sphere. And of course, there is a huge literature on the relationship between these ideas and the concept of privacy, both in terms of selfhood and in terms of relating to those beyond the household. On the other hand, the roots of these concepts have a much longer early modern legacy, but they were interpreted and played out in different ways in early modern practice. I don’t want to criticize unjustly, so I’ll say that I have not read Ware’s body of work yet. I might be way off the mark here, but it sounds like she is speaking of a particular strain of feminist history, and not the whole. All the comments above point to this idea: sure, foregrounding and analyzing the personal in order to reveal the subcutaneous political is a big project of feminist scholarship, but it’s not the only one going. I can only wonder what stymied Ware in this project since, as almost everyone above has brought forth nicely, there appears to be a pretty rich biographical project simply from the problems that Ware cites. I’m tempted to surmise that Ware, for idiosyncratic reasons beyond human measure, just wasn’t captivated by the material. That can happen, too, but it’s hard to explain even to colleagues how or why a major project with such promise just flames out. There’s an element of “this is so freaking cool!” that goes into most great humanities and social science research projects, even if other scholars have to scratch their heads to see why the author is so pumped up about it. Without that je ne sais quoi, it’s hard to birth the work properly. I’m about a 1/4 of the way through the article. I can sympathize with Ware. I have a project that at first seemed like it might make a path breaking monograph, but now I’d be lucky to squeeze an article or two out. I really like Comradde PhysioProffe’s reminder that sometimes it takes an imagination differently constructed to make sense of the data. I’m teaching the senior thesis class for undergraduates in the fall. I might assign this article as a way to have a discussion about what makes a research project go. How do you know you have enough of the right kind of sources to write an essay or article about your topic? Thanks for the post Historiann, it made me feel like a historian again. Back to weeding the garden. I’ve found the comments tremendously interesting, and I wanted to add on the specific issue of interiority/exteriority and the self, even without abandoning those concepts one of the things us premodernists have had to do is what we call “reading against the grain”. (I think of Alison Weber’s extraordinary discussion of the sixteenth-century mystic Teresa of Avila, which unpacks her subversive use of feminine tropes, in “Teresa of Avila and the Rhetoric of Femininity.” Talk about reading against the grain. In Teresa’s case, we have autobiographical information, but Weber rightly questions what we can learn about her subjective interior self from her deliberately crafted version of herself produced in that autobiography.) So Paul doesn’t make clear statements about her notion of selfhood and experience – does that mean there is nothing revealing of her selfhood and experience in her writings? I find that hard to believe. It might not contain autobiographical data (this is how I felt when my father died and how that grief affected my future relationships), but it contains vital information on how Paul viewed the world and her (and all women’s) place in it. She has a unique view, and I find her conscious de-personalization fascinating in and of itself. Of course, I’m not interested in biographies at all in the traditional sense. Maybe the idea here would be to abandon the concept of biography and instead reconstruct Paul’s vision for the world and women, and how that vision shaped her choices and her role in the feminist movement? Surely that’s an important contribution? Coming at this as a literature scholar and not a historian, I suppose that two things bugged me, from a theoretical perspective, about what Ware had to say. 1) Her narrow definition of what “counts” as feminist biography (or, I suppose, more generally, feminist history, or feminist scholarship at all) really irks me. With all of that said, I believe that any thinker has the right to jump ship on a project that isn’t a good fit, has the responsibility, in some respects, to work on topics that will ultimately make their way to a public audience and affect how people think. But a project not fitting doesn’t necessarily make it a broad-range problem of the type of project or the topic of the project. The issue might not not be Paul’s unsuitability to feminist biography – it might be Ware’s unsuitability to write a feminist biography of Paul. It makes me irritable when eminent scholars announce what sort of work in a field is possible, as if just because they can’t do it, it can’t be done. The issue might not not be Paul’s unsuitability to feminist biography – it might be Ware’s unsuitability to write a feminist biography of Paul. Yeah. This was exactly my point, but you made it more clearly and concisely. It makes me irritable when eminent scholars announce what sort of work in a field is possible, as if just because they can’t do it, it can’t be done. I clearly didn’t read closely enough to get this further aspect of Ware’s attitude, but, yeah, this attitude is total bulleshitte. So I still maintain that Ware shouldn’t be blamed for lack of imagination, but she should be blamed for implying that no one else could possibly imagine anything she can’t. Must go read Ware’s article, but no one has mentioned Psychology yet – our restore to know feelings is very modern. Much as feminists have rejected Freud, we seem to buy the importance of feelings. It sounds to me as if Paul was like my grandmother in this way (otherwise, someone less sympathetic to Paul is hard to imagine) – that by and large you noticed your feelings only long enough to control them so you could do what was right. So we might want to argue that there is a less psychologized version of subjectivity that we need to grapple with. I like Dr. Crazy’s suggestion (if I follow her correctly) that it can perhaps be antifeminist, or at leat play to stereotypes, to demand a close examination of the *private* lives of *women* subjects in particular. This is what I was also wondering, when I made the comment in the original post about “isn’t the public life enough?” I realize that it’s hardly cutting-edge or theoretically sophisticated, but my sense is that a traditional biography that treated a woman’s public life and contributions as worthy of 300 pages would itself be a very feminist biography. It’s not like we’re awash in women’s lives either in the trade presses or in the historical profession. H’Ann – yep, you follow me exactly correctly. And actually, I’d say that asking that question *is* cutting-edge and theoretically sophisticated (though, of course, I have to believe that given my current book project) – or has the potential to be so. How I’d frame it would be this: Obviously the work of second-wave feminist scholarship is the foundation for demonstrating how we might value the personal as bound up with political consequences, and it has been instrumental in shifting scholarship toward valuing the personal as central rather than as peripheral or inconsequential. The questions (for me) become: what is the next step? How do we build on that work – as opposed to doing some sort of postfeminist, third-wave about-face – *while at the same time* acknowledging the limitations of a critical perspective that *insists* on an inclusion of the personal as a criterion of feminist work? Is there a way that we can value the personal while at the same time we understand the value in women (and women’s texts) that resist such “personal” readings or accounts? And if there is a way forward that allows us to do this, how might it change our perspective on some events/people/texts that we originally understood through approaches that emphasized the personal? Dr. Koshary: I’m tempted to surmise that Ware, for idiosyncratic reasons beyond human measure, just wasn’t captivated by the material. That can happen, too, but it’s hard to explain even to colleagues how or why a major project with such promise just flames out. Dr. Crazy: But a project not fitting doesn’t necessarily make it a broad-range problem of the type of project or the topic of the project. The issue might not not be Paul’s unsuitability to feminist biography – it might be Ware’s unsuitability to write a feminist biography of Paul. It makes me irritable when eminent scholars announce what sort of work in a field is possible, as if just because they can’t do it, it can’t be done. Great discussion as always. I find it sexist and essentialist to project, onto a woman whose biographical traces resist it, the expectation that her life should reveal a particular kind of self because she’s a woman (and because the scholar identifies with feminist approaches to history). Combing archives and *finding* women talking about domestic spheres, childbearing, etc., in a nicely-packaged relatable way, is one thing, and it’s important to use that to broaden our sense of what counts as history. But combing those archives *expecting and wanting* to find women talking about those things, and wanting to find a woman whose “self” gives us warm fuzzies, is problematic. Like you, Historiann, I wonder why a woman can’t have a life that is primarily “public” without it being questioned in the name of feminism – that to me seems anti-feminist. In the same way, I get irritated when I see things like “work-life-balance workshops” aimed at women in particular. (And why doesn’t work count as life?) Sure, in heteropatriarchy, women do end up doing a lot more of that kind of juggling than men do. But that doesn’t mean we can’t start changing expectations by, for example, having gender-neutral work-life-balance workshops. My library hasn’t got it yet but it looks like an important corrective to a tendency in early modernist studies – highlighted by the term early modern itself – to look primarily for anticipations of our modernity. We have never been modern, as Saint Bruno says. I can certainly understand why Ware wanted to get *something* out of the year she spent with the Alice Paul papers and thinking about how she was going to write her biography. (She’s an independent scholar, and so doesn’t have a T&P committee or post-tenure review to answer to.) Ware did us a great service with the remarkable insight into her perspective on Paul as a biographical subject. I also think she gives Paul’s future biographers a great deal of helpful information and interpretive ideas–even though, as CPP and Matt have pointed out, she wasn’t suited to writing those books. Hahahahaha. You are such a seminar-leader. Do we get to write teaching evaluations at the end? Yes. Yes, I am. Of course, you can leave your evaluations in the comments at any time! I’d like to also put in a plug for archaeology as a means to access the everyday lives of women (and men), including reformers (and in the sense of having material evidence of their personal choices, some glimpse of interior life). Some notable recent/ongoing examples: Kim Christensen, newly Dr’d from Berkeley, has done some really great work looking at the every-day life of Matilda Jocelyn Gage; Hadley Kruczek-Aaron’s looked at the family life of Gerrit Smith; Doug Armstrong is leading work at the home of Harriet Tubman in Auburn, NY; Mark Leone is leading work at Frederick Douglass’ MD childhood home, Wye House. I’m reading her article now (and will pass on the link to a colleague who works in the fields of gender history and biography). I find it refreshing to see someone write about the issue of research as decisions and “fit”. Not every project works for every person and Ware’s made the case for why this project, despite some appeals, wasn’t a good fit for her. She doesn’t NEED to write this book. She doesn’t see a way for her to write this book. Her one failure in my book is that she can’t imagine someone else taking up the task of an Alice Paul biography and we all know how difficult it is to admit that someone else will do a better job of something that we would’ve liked to have tackled. My research to-do list includes tackling the lives of some sixteenth, seventeenth and early eighteenth century women who were stepmothers. I want to see how that role affected their own lives and those of people around them. I don’t expect to get too much reflective “interiority” given the sources available. Coming in with that first and foremost will make any insights I manage to glean all the more valuable. If I came to the project expecting to see these women lay out exhaustive commentary on their lives and experiences, I’d surely be discouraged. You can’t demand resources that don’t exist but you can think how to use well what does: that’s what I remind my students when they start sketching out their own research. Thanks for your perspective, Janice. I figured that you’d also be a little perplexed by the expectation that your sources would “talk back” to you or reveal their inner lives. I wonder if a relevant distinction to make here is the difference between feminist methodologies and feminist scholarship. I would say that a relatively straightforward biography of Paul would likely constitute feminist scholarship in that it is adding important feminist knowledge to the world, but that may or may not use a feminist methodology. I think my nit to pick with Ware is that she seems to be forwarding a relatively narrow view of feminist methodology. What I see Ware as saying, in a sense, is that in the materials available, the scholar has little direct access to anything beyond Paul as a Cartesian subject. And indeed, much of feminist methodology is focused on undermining the validity of the Cartesian subject–but I don’t think that’s a necessary quality. I’m not a historian, but if I were writing about Paul (based exclusively on Ware’s article), I would probably be interested in writing about the insistence on a carefully crafted public identity as part of her political practice— I’d be interested in situating this particular act (as a political act), within her politics more broadly. While a historian would do this differently than I would, it doesn’t seem unreasonable that something like this could be a historical project. I would also argue that this would be grounded in feminist methodologies because I would be interested in working materially from the subject’s actions as political practice. So, yeah, not Ware’s project, but certainly space for a feminist methodology differently construed. Biography has been getting some systematic attention recently in scholarly circles. The Huntington Library and University of Southern California last week co-sponsored a conference organized by Annette Gordon-Reed on “Early American Biographies.” And at the conference of the Society for Historians of the Early American Republic in Baltimore next month there will be a panel titled “Revisiting Female Biography: A New Roundtable.” Maybe some of these issues will see daylight there. For me, Natalie Z. Davis’s triptych, _Women on the Margins: Three Seventeenth Century Lives_ still offers a pretty good model of how to scrape at least some semblance of “interior” space from sources that are not really exemplars of self-revelatory expression. A lot of Paula Backscheider’s work has been about looking at biographical practice from a literary perspective. I think you’re right on the “in-law” part, but I can’t remember the details either. There’s an interesting review by Donna Rifkind in the Sunday _NYT_ book review today of Alice Kessler-Harris’s biography of Lillian Hellman. Not much about feminist approaches to biography, or biographical methodology, or certainly about interior lives, but there seems to be a sort of subtext based in ongoing controversies about the 20th Century and the politics of the Cold War, and about how historians tend to (in the reviewer’s view) effect the intersection of lives with times. I don’t know much about Rifkind as a writer. A quick google search seems to suggest that she’s mainly a reviewer of books. Perhaps if we don’t have a exclusionary definition of “feminist biography,” and if we don’t have an exclusionary definition of “feminist methodology,” it will be possible to write about many women whose lives seem useful (to feminists and others). People need to write what they need to write–and not to write what they don’t. Ladyanna–yes, there certainly seems to be a subtext concerning the politics of the Cold War in Rifkind’s review. I wonder how the Kessler-Harris biography reads? I can’t tell from this review. Thanks for your comment, Jean. I’ve long wondered if it was really useful any more to wrestle over definitions of what constitutes a feminist biography. I think any biography of a woman that takes its subject seriously and which doesn’t apply a double standard in analyzing the life will probably qualify. Is it true that the ERA (the version that passed Congress in the 1970s) could still be ratified by the vote of one more previously-unratifying state? I was on the Washington D.C. march for it on July 9, 1978–I’m looking at the button not three feet from my nose now. And I know that Congress subsequently extended some sort of a “deadline” for ratification, but that that deadline too passed, I think in 1981. I don’t pretend to know the constitutional details of ratification processes, but if that could still be done, then ten million people or so moving to, say, Wyoming, for a year or two, would make a nice slam-dunk denoument for the Occupy movement.